Hu Kwa is purported to be the top-notch Lapsang Souchong from Taiwan. Steeping one cup at a time, I use one teaspoon of leaves per cup, and I steep the tea for five and a half minutes in just-boiled water, as per Mark T. Wendell Tea Company's website. The dry leaves have a very strong smokiness to them, as is normal with Lapsang Souchong. However, with this one, there is a slight undertone of sweetness that can be noticed in the dry leaves. The aroma of the steeped tea is also quite smooth. Past experience with Lapsang Souchong has exposed me to some that were so rough as to suggest that perhaps one should be sitting outside on the ground around a campfire while drinking them, not sipping this noble drink in a more civilized setting. Photo credit to the Mark T. Wendell Tea Company. 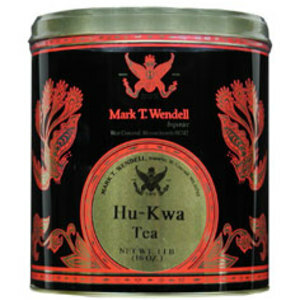 This tea may be found and purchased from the Mark T. Wendell Tea Company website, here.